This fun French counting song “CINQ CITROUILLES” (Five Pumpkins) starts with five pumpkins sitting on a log. One falls down, then there are four. Four pumpkins are sitting on a log. One falls down, then there are three, and so on and so forth. The song is from Whistlefritz’s CD CHA, CHA, CHA. 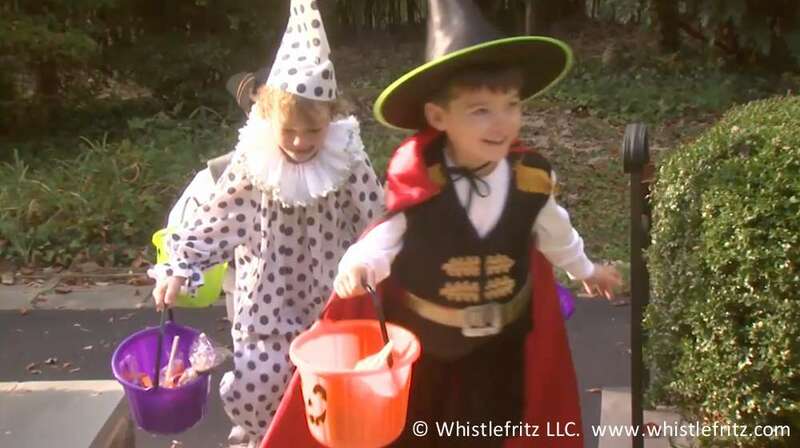 Song “CINQ CITROUILLES” from the Whistlefritz CD CHA, CHA, CHA. Une est tombée, il n’en reste que quatre. Une est tombée, il n’en reste que trois. Une est tombée, il n’en reste que deux. Une est tombée, il n’en reste plus qu’une. Elle est tombée, il n’en reste aucune. This high-energy French song “HALLOWEEN” teaches Halloween-themed French vocabulary. Pumpkins, witches, ghosts, and skeletons all make appearances as kids sing about trick-or-treating. Aujourd’hui c’est Halloween. On vient à ta maison. Bêtise ou friandise ? Un sort ou des bonbons ? The song is from Whistlefritz’s CD CARNAVAL. Song “HALLOWEEN” from the Whistlefritz CD CARNAVAL. Un sort ou des bonbons ? What could be better than a day celebrating crepes? That’s exactly what happens on La Chandeleur! La Chandeleur is a fun and tasty French tradition associated with the February 2nd holiday of Candelmas. The French tradition involves the preparation of delicious crepes. 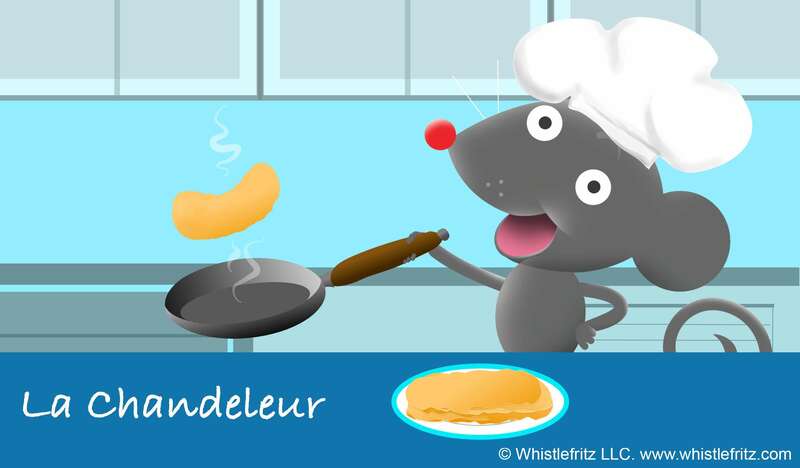 This original French children’s song –“LA CHANDELEUR” — teaches kids French vocabulary for ingredients and baking. Listen to this playful song as you prepare simple crepe recipes with the children, learning French along the way. The song, composed by Didier Prossaird, is from the Whistlefritz CD CARNAVAL. Song “LA CHANDELEUR” from the Whistlefritz CD CARNAVAL. This French Mother’s Day song — “LA FÊTE DES MÈRES” — is a perfect sing-along for young children and school classes to celebrate Mother’s Day. The song teaches children French vocabulary for things mothers do for their children as well as typical Mother’s Day gifts. The beautiful sentiment expressed in the song is a fitting tribute to mothers and their relationships with their children. The song, composed by Didier Prossaird, is from the Whistlefritz CD CARNAVAL. Song “”LA FÊTE DES MÈRES”” from the Whistlefritz CD CARNAVAL. Mais quel cadeau lui faire ? Qu’est ce qui pourrait lui faire plaisir ? M’aideras-tu à choisir ? OK ! Ranger toute la maison ? Acheter un bouquet de fleurs ? Acheter une boîte de chocolats ? Lui faire son gâteau préféré ? Un petit déjeuner au lit ? Écrire une gentille lettre ? Ecrire “je t’aime” peut-être ? Chanter une jolie chanson ? Bonne fête Maman, mon cadeau à moi c’est toi ! La galette des rois — the “king cake” or “kings’ cake” — is a fun and tasty French tradition associated with the January 6th holiday of Epiphany. According to tradition, the baker of the cake inserts la fève — a tiny charm or figurine — into the cake and then it is sliced. The youngest person in the group goes under the table and, without peeking, tells the server who gets each piece of the cake. Each participant receives a slice of cake and the one who discovers la fève is king for the day! 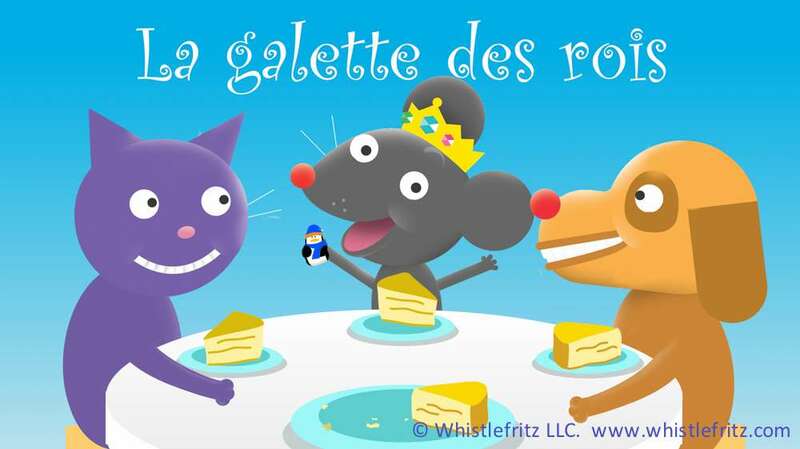 This fun original French children’s song — LA GALETTE DES ROIS — describes the tradition and how the game is played. The song, composed by Didier Prossaird, is from the Whistlefritz CD CARNAVAL. Song “LA GALETTE DES ROIS” from the Whistlefritz CD CARNAVAL. It’s not a party without cake! This catchy song teaches the French words for grandparents. 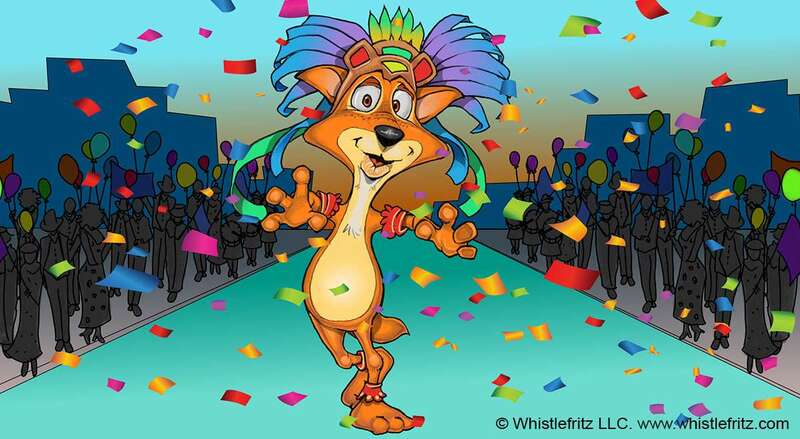 The song in this clip is “Y’A PAS DE FÊTE SANS GATEAU” from Whistlefritz’s CD ALLONS DANSER. The video is from the Whistlefritz video L’ANNIVERSAIRE DE FRITZI. Song “Y’A PAS DE FÊTE SANS GATEAU” from the CD ALLONS DANSER. Y’a pas d’fête sans gâteau. Aimez-vous les fêtes d’anniversaire? (Do you like birthday parties?) Join the language-learning celebration as Marie and the Whistlefritz kids plan the perfect party for their playful animated friend, Fritzi the mouse. Balloons, cake, presents, and special guests add an exciting twist to learning French in this lively, interactive French immersion program. At a Whistlefritz party, even cleaning up is fun! Each step in the party-planning process is captured through entertaining animated segments, live-action footage and upbeat interactive songs that teach words and phrases for toys, colors, parts of the room, household objects, and everyday activities. The video includes an easy-to-use translation guide for parents and teachers, as well as French and English subtitle options. What are you waiting for? Let’s get this language-learning party started! The song in this clip is “L’HEURE DE RANGER” from Whistlefritz’s CD ALLONS DANSER! Awards: Winner of a 2018 Parents’ Choice SILVER Award. Winner of a 2018 NAPPA (National Parenting Products Awards) Award. Winner of a Tillywig Toy and Media Awards Brain Child Award. Winner of an Academics’ Choice Awards Smart Media Award. Winner of a Dove Foundation Seal of Approval. Winner of The National Parenting Center’s Seal of Approval. Endorsed by KIDS FIRST! Song “L’HEURE DE RANGER” from the CD ALLONS DANSER! Video trailer from the Whistlefritz video L’ANNIVERSAIRE DE FRITZI.